Saltaire in the 1940s - Who, what, where, when? Matthew Godfrey writes: I have an old group photograph taken in I'd say the 1940's in what maybe Saltaire Victoria Hall and wonder if the Saltaire History Club would be interested in publishing it on the site to ask if anyone recognises the event, themselves and/or any of their relatives. Although I can recognise 4 members of my family, the photo is still a bit of a mystery and was found in my dear Great Aunty's house in 2011 after she sadly passed away. See the photo attached. If it is something of interest would love to hear from you. My family lived in Saltaire from the 1930's and I lived on Dallam Avenue between 1993 and 2001.My Great Grandparents, Grandfather and his siblings lived at 15 Dallam Avenue from the 1930's after living in Shipley. I was, like most local poeple born at the Maternity Ward in Shipley, and my Grandparents and Dad and Uncle were born and lived off Saltaire Road. I have a few pics off that area etc. My Great Aunty died in 2011 aged 95 years and she had lots of photographs and even some cine film some of which naturally included parts of Shipley and Saltaire from the early 1900's to the 1960's. My Grandparents (Godfrey) moved in the mid 1960's to 30 Dallam Avenue till my Grandmother died in about 1992. I bought the house off my Uncle and lived there till 2001. Being a local lad I know from my family history that I have several relatives that lived and died in Saltaire (as well as Shipley). It's the few pics I have of groups that are of interest because it would be lovely to know where they were taken and see who a lot of the other people on them are. In August last year I held a family reunion for the MACKIN family, my paternal Grandmother's family. 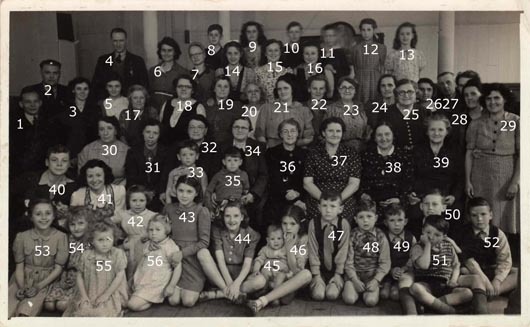 My interest in history and family history led me to look and find as many family members as possible and organise a reunion held at The Shipley District Social Club off Saltaire Road. Relatives I found came from as far as France and Canada. It would be lovely to identify some of the boys in the pic of with the boys sat on the wall. Two of them are my Dad's cousins Peter and Alan Mackin, and one someone thinks is a boy called Brian Spence. I think they are sat on a wall at the end of Herbert Street but could be wrong. 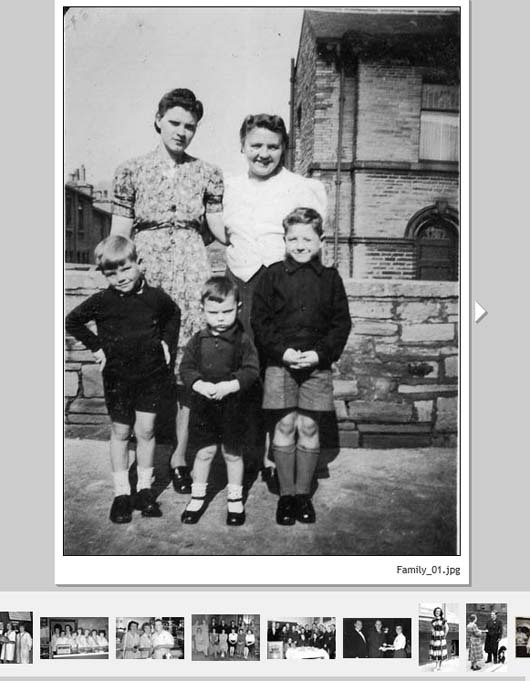 The other picture includes some relatives but don't know who the woman on the left is nor the two boys on the left and in the middle? One of them may be my Dad's cousin as the boy on the right is. Interesting to know which street it is showing going up behind them. Are they stood in front of Albert Terrace or Caroline Street or another? I have some group pictures of Saltaire Picture House (Gaumont) from off the top road. My Great Aunt May Procter (nee Godfrey) and Uncle William Procter worked there for over 50 years as an usherette and cinema engineer and in their belongings there were some pictures from the 1950's. It would be nice to put some names to people. My Great Uncle is on a lot of them (round glasses). The Lady Mayoress is on one of them. Will anyone recognise themselves? See the gallery - a person roughly dated some of the pictures by the films on the billboards. My Uncle Bill is the chap on Ken's right wearing the glasses - again love to know where this was, when and who the other people are?